A fantastic combination of Nepal tour package, Nepal trekking package, and wildlife tour package. You will start this trip from the cultural hub of Kathmandu city. Visit various World Heritage Sites, Buddhist stupas, and Hindu temples. 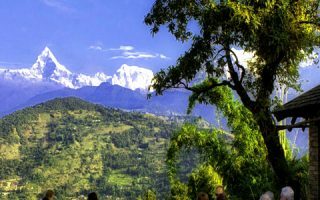 You will then visit the famous tourist destination of Dhulikhel famous for Himalayan views, sunrise, and sunset views. You will then travel south, to Chitwan where you will get an opportunity to glimpse endangered one-horned Rhinoceros. Your Nepal adventure will start from Pokhara. From here, you will trek through one of the world’s famous Annapurna trekking circuit. Pass through various remote villages en route, immerse in Nepali culture and enjoy the scenic views of the Himalayas every day. During this Annapurna trek, you will experience a great deal of geographical and cultural diversity. Morning, sightseeing tour of Pashupatinath temple. This Shiva temple is the holiest shrine of Hindus all over the world. Continue on to Boudhanath Stupa. On the eastern side of Kathmandu is a huge stupa of Boudhanath. This is the largest stupa in Nepal and one of the largest in the world. It is the sacred place for Buddhist pilgrims. After breakfast, sightseeing tour of Bhaktapur Durbar Square. Bhaktapur is one of Nepal’s greatest treasures. Visitors have described Bhaktapur’s Durbar Square as ” the most entrancingly picturesque city scene in Nepal”. The Square is scattered with magnificent man-made treasures. After breakfast, drive to Chitwan (165 kms/5 hrs). Situated in south central Nepal, the park covers 932 sq. km in sub-tropical lowlands of Terai. About one – fifth of the park is savanna with over 70 different species of grasses, known generically as “elephant grass”. Chitwan is among Asia’s finest national park, renowned for its variety and abundance of wildlife. After lunch, commence an elephant safari to explore the jungle and view various wildlife. Full day jungle activities such as jungle walk, visit Tharu tribal village, dugout/canoe ride, visit Elephant and Crocodile breeding, center etc. ; Evening, cultural show presentation by local Tharu tribes. After breakfast, drive back to Kathmandu (185 kms/6 hrs). Upon arrival in Kathmandu, transfer to the hotel.